Delivery Man is an American remake of a French-Canadian film, which seems appropriate since its lumbering script sounds like it was rendered using Google Translate. 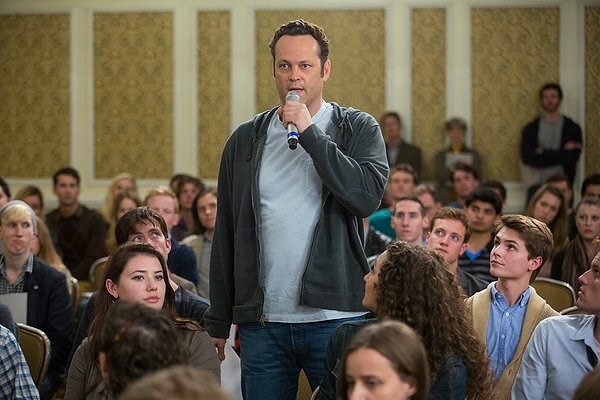 Writer-director Ken Scott appropriates his 2011 movie Starbuck about a prolific sperm donor into a Vince Vaughn vehicle that manages to neuter its hyperactive star. David Wozniak (Vaughn) is a delivery man for his family’s New York City butcher shop. He’s also a hopeless screw-up, whether its failing to properly deliver uniforms for the business’ rec basketball team or going weeks without contacting Emma (Cobie Smulders), his pregnant girlfriend. The only thing David was apparently ever good at was donating sperm 20 years ago under the alias Starbuck. One day, a lawyer appears to inform David that mismanagement by the fertility clinic resulted in him fathering 533 children, and that 142 of them now want to pierce David’s confidentiality agreement with the clinic and learn the identity of their biological sire. As legal wrangling ensues, David sifts through a dossier containing the bios of his children and drops like a deux ex machina into their lives to help with their problems while never revealing his true identity. There’s a drug-addicted daughter, a frustrated actor stuck in a dead-end job as a barista, and a struggling street musician. There’s a gay son, a black daughter and a severely handicapped boy (who cannot speak or otherwise communicate, calling into question how he expressed a desire to find out his biological father). One’s also a professional basketball player spotlighted with no further elaboration, probably so Vaughn could film at a Knicks game. Delivery Man wanders aimlessly between light-hearted and treacly without ably conveying either emotion, particularly Vaughn and his pained efforts. There’s the obvious illogic of David appearing in the lives of dozens of people and, later, support group cookouts with all his children without anyone getting suspicious. Moreover, it’s baffling how Starbuck becomes an object of national derision for something that wasn’t wrong or his fault. As Brett (Chris Pratt, seemingly medicated), David’s bumbling attorney, argues during a rare moment of lucidity, none of these children would be here if it wasn’t for Starbuck. Nary a moment is devoted to the legal mothers and fathers of these children; it’s as if they don’t exist. And the subplot involving David and Emma’s pending parenthood lurks in the background until a hasty resolution over the film’s final minutes. From its wandering narrative to its dim-witted dialogue, Delivery Man has the earmarks of a screenplay grounded in its fertile premise that no one realized couldn’t gestate into a feature-length film until midway through production.